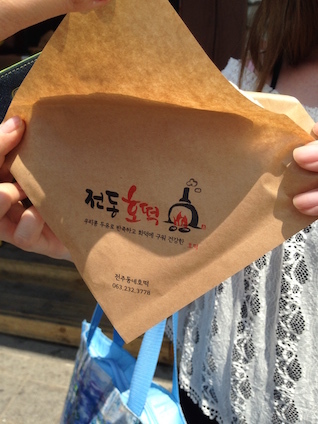 15 Things to Eat in Jeonju’s Hanok Village | Canak-Knock! Who's There? As a person who loves eating and loves Korean food, I couldn’t miss out on going to the place with the most delicious meals in Korea. The food available on the streets in the Hanok Village are not exactly traditional Korean food, but they were still delicious. 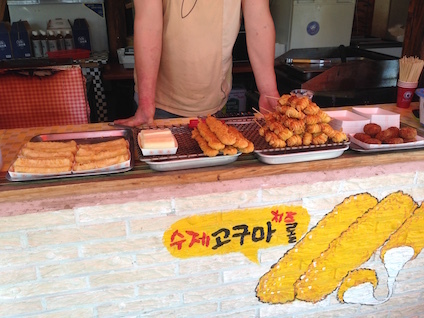 Here are 15 things to eat in Jeonju’s Hanok Village. 1. Shrimp Dumplings- My favorite. 2000 KRW per piece. This may sound expensive but it’s huge and delicious. 2. 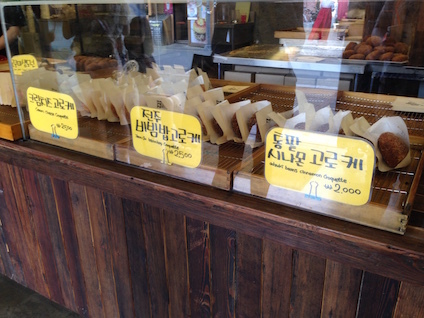 Soy Milk Hotteok and Cream Cheese Hotteok– My second favorite from the Hanok Village. Hotteok is usually with cinnamon sugar, but this is a little different. 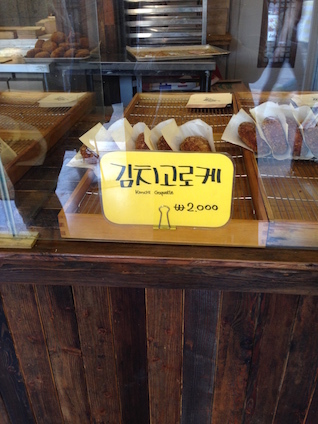 The soy milk one is 2,000 KRW and the cream cheese one is 2,500 KRW, but when you buy two together, the total is 4,000 KRW. 3. Sweet Potato Cheese Roll– Mozarella cheese and sweet potato paste in a crispy roll! They also have Fried Ice Cream. 4. 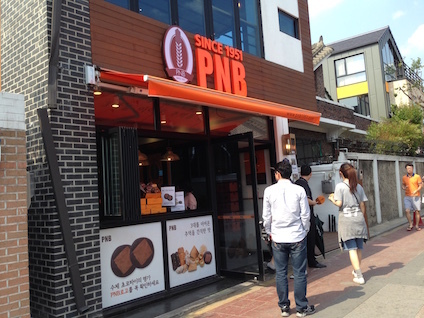 Chocopie and cookies from PNB– There were at least two of these located in the Hanok Village. 5. 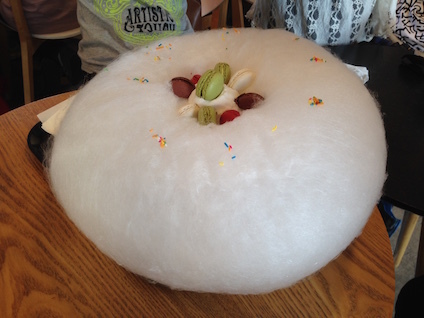 8 Beat Bingsu– This was from a cafe called 달콤한구석, which means “sweet corner.” This cotton candy, macaroon, ice cream, fruit bingsu was 12,000 KRW. Try eating a macaroon wrapped in cotton candy! 6. 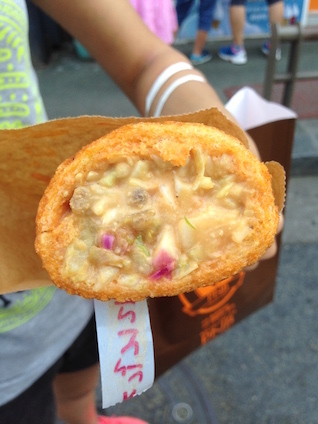 Muneokkocchi– This one was so popular I didn’t feel like getting in line… This is a squid skewer! 3,000 KRW each. 7. Ice Cream Bars– I didn’t have the space in my stomach to eat this, but they had many flavors including Guinness Beer flavor, Wasabi flavor, and other fruits. 3,000 KRW each. 8. Jeonju Bibimbap– My friends and I were not sure how Jeonju bibimbap was different from other bibimbaps. The only difference we found was that they always included a yellow acorn jelly. 9. Beansprout Rice Soup- One of the famous restaurants in the Hanok Village is called 삼백집. 10. 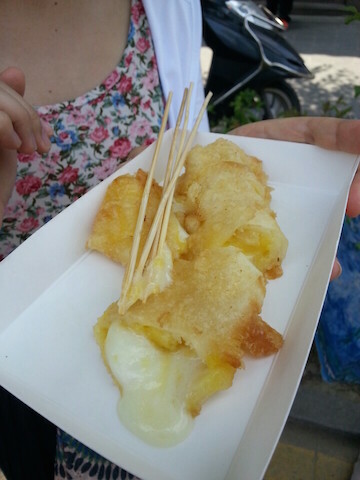 Spicy Cheese Chicken Skewer- I forgot to take a picture of this, but it was pretty good! Only bad thing was that you would have a hard time getting the red sauce away from your cheeks or clothes. 11. Baguette Sandwiches from Gilgeoriya– They call this Baguette Burger but it looks like a sandwich to me. They are 4,000 KRW each. 12. Unique Croquette flavors– They had kimchi flavor and bibimbap flavor! Another thing that I have to try next time because I was too full… This was located next to the baguette sandwich place. 14. Moju– My friends and I thought it was makgeolli, but it was actually a different alcohol called Moju. It is made from Makgeolli, but it is boiled with a variety of herbs. The alcohol content is quite low. They also had Moju slushies. 15. Traditional Korean food– There are many… many… side dishes. 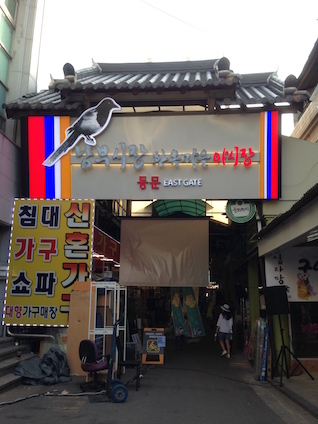 EXTRA: Next to the Hanok Village there is a market called the Nambu Shijang (남부시장). 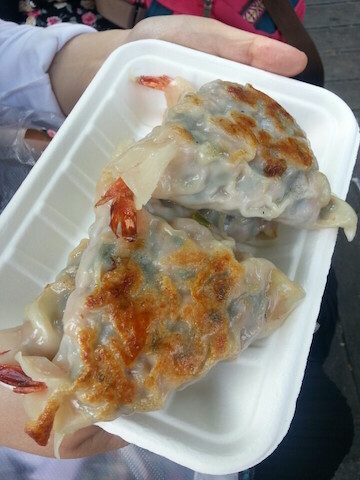 There is quite a wide variety of street food there as well. There was a popular gopjang stand. To get to this shijang, start at the church in the Hanok Village, cross the street towards this gate in the picture below, and then look for an entrance like the one in the bottom picture. 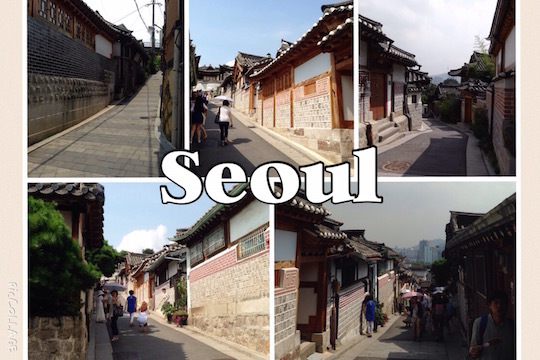 How is Seoul’s Hanok Village and Jeonju’s Hanok Village different? 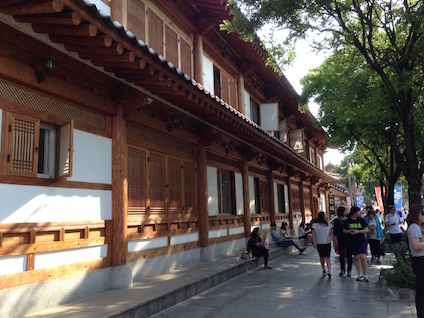 In Seoul, people actually live in the Hanok houses, so there are signs warning tourists to be quiet. 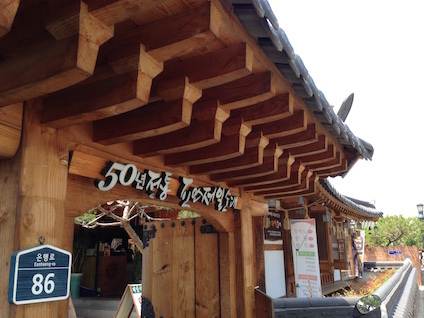 The only people who live in Jeonju’s Hanok houses seem to be the Hanok Guest House owners. 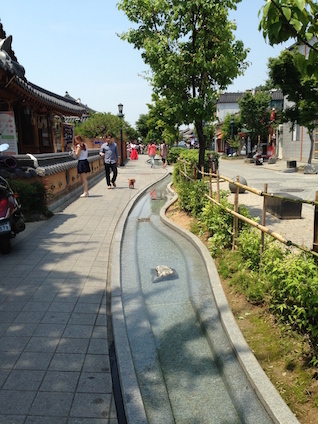 Jeonju also has many public restrooms and trash cans. 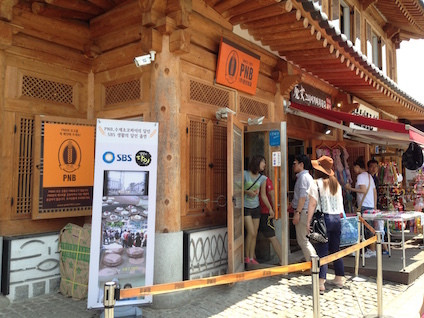 The hanoks in Jeonju also seem to be more modernized. Seoul’s neighborhood is quite an exercise because of the steep hills. 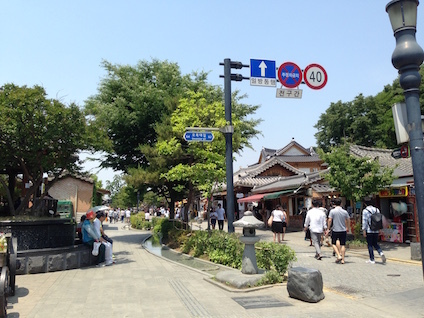 Jeonju’s streets can cater to many tourists because it is flat and wide. There were some tourists biking in the area. 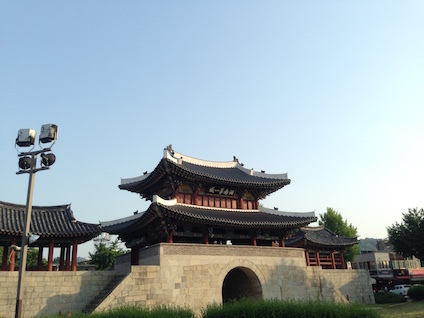 One can easily walk to Seoul’s Bukchon Hanok Village from Anguk Station, but to get to Jeonju’s Hanok Village, one would have to take a bus or taxi from the major subway stations and express bus terminals. Bukchon is surrounded by an area full of nice cafes and restaurants, but Bukchon itself is mostly quiet and only for looking. 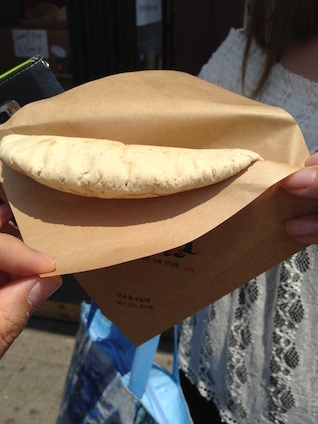 The one in Jeonju is more lively and has a wide variety of street food! Make sure to bring a lot of cash and come with an empty stomach to enjoy a full day full of unique delicacies. KTX– A smooth 90 minute ride for about 35,000 KRW. This departs from Yongsan Station. Bus– It is a three hour bus ride for 12,000~14,000 KRW. There are two bus terminals so be careful when you try to meet up with your friends. 전주시외버스터미널 and 전주고속버스터미널. Free Shuttle– You need a foreign passport and you’ll have to reserve on the website in advance. Thanks for the all the recommendations!